Harry Edwards is a sociologist and professor emeritus at the University of California-Berkeley. In 1967, he founded the Olympic Project for Human Rights, which organized a boycott by African-American athletes of the 1968 Olympics and black power demonstrations at the Mexico City Games to protest continued racial discrimination faced by African-American athletes in college and within a larger, racially polarized society. Two members of the movement, sprinters Tommie Smith and John Carlos, staged the famous black power protest, raising clenched fists with black gloves as the national anthem was played on the medal stand at the Olympic Games. Both were kicked off the U.S. Olympic team and were ostracized by much of white America. A former star basketball player at San Jose State University, the 75-year-old Edwards is the author of The Revolt of the Black Athlete and numerous articles. In recent years, he has served as a consultant to the San Francisco 49ers and the Golden State Warriors. Edwards was interviewed by Sunni M. Khalid for The Undefeated. The interview was before LeBron James, Dwyane Wade, Carmelo Anthony and Chris Paul made their statements supporting Black Lives Matter at The ESPYS Wednesday night. WHAT DO YOU THINK OF THE RECENT POLITICAL ACTIVISM BY SOME BLACK ATHLETES TO THE RECENT SURGE OF POLICE KILLINGS OF BLACKS AND THE BLACK LIVES MATTERS MOVEMENT? “There’s no question that they are in a tradition. To be honest, it goes back to Jack Johnson, who wanted to be more than an athlete and a celebrity. This was a man who went into a hotel in St. Louis, and when they told him they don’t have any rooms for ‘your kind,’ he told them, ‘It’s not me, it’s for my lady and she’s your kind.’ And he was immediately escorted out of town. Joe Louis, Jesse Owens, Jackie Robinson and Larry Doby stood for more. And, of course, there’s Paul Robeson, who was not only a tremendous athlete, but an artist. Then there was Jackie Robinson, Kenny Washington and Woody Strode in the NFL, and Marion Motley and Bill Willis in the All-America Football Conference. 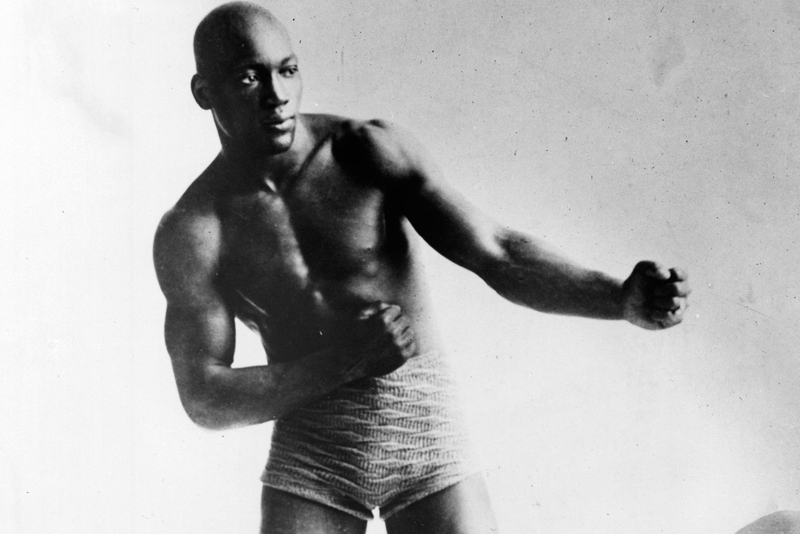 Boxer Jack Johnson poses for a portrait. HOW CLOSELY HAVE YOU FOLLOWED THIS MOVEMENT? “Very closely. Two years ago, there was Ariyana Smith, a women’s basketball player from Knox College in Illinois, which was just a few miles from Ferguson, Missouri. She found it unconscionable to go to [Fontbonne University in Clayton, Missouri] and play there and not say anything about Michael Brown. During the national anthem, she went in front of the flag and laid there on the floor for four minutes and 30 seconds, which was a reminder that the Ferguson police had let the body of Michael Brown lay in the street for four hours and 30 minutes before they removed it. “Then there were the St. Louis Rams players, who came out for introductions with the ‘don’t shoot’ pose. Then there was LeBron [James] and [Dwyane] Wade wearing hoodies in the pregame shoot-around after Trayvon Martin was murdered. Then there was the Donald Sterling issue, with players on the [Los Angeles] Clippers threatening to refuse to play, which threatened to collapse the league. They forced the sale there. WHAT IS YOUR REACTION TO SOME OF THE MEDIA COVERAGE OF BLACK LIVES MATTER? “After Dallas, you had all these talking heads on CNN and other networks talking about this was the largest massacre in a major American city, but they don’t know enough to mention the wholesale killings of black people. HOW DOES THIS RESONATE IN PLACES LIKE OAKLAND, CALIFORNIA, WHERE MANY OUTSPOKEN BLACK ATHLETES ARE FROM? “Oakland is the birthplace of so many great athletes, from Bill Russell, Frank Robinson. Cito Gaston, Vada Pinson, Gary Payton to Jason Kidd, all come out of a history of struggle. DO THE ACTIONS OF SOME OF TODAY’S AFRICAN-AMERICAN ATHLETES REMIND YOU OF THE MOVEMENT OF THE 1960S? “It doesn’t remind me; it’s the same struggle. WHAT ROLE DOES MONEY PLAY IN DISCOURAGING SOME ATHLETES FROM TAKING A POLITICAL STAND? HOW DOES THE BLACK LIVES MATTER MOVEMENT FIT INTO YOUR HISTORICAL NARRATIVE? “This is supposedly a post-racial America. The biggest difference now between then and now is the big money of television contracts from the ’80s into the beginning of the second decade of the 21st century. Society would like to turn away from facing and confronting injustice. That’s not working for black America. These are the same issues that are built into the cultural affairs of this country, which have always trended toward white supremacy in every walk of life. Law enforcement, police brutality and white supremacy have always been where the rubber meets the road. “Don’t just look at the athletes, look at society. There was always this conclusion that the civil rights era was dead, that it wasn’t necessary. DO YOU SEE ANY OTHER SIMILARITIES BETWEEN THE BLACK LIVES MATTER AND PREVIOUS MOVEMENTS? “Yes. You had the civil rights movement, SNCC [Student Nonviolent Coordinating Committee], CORE [Congress of Racial Equality] and other organizations. The Black Panthers, which started in Oakland, with Huey Newton, David Hilliard and Bobby Seale, grew out of a resistance to white supremacy. These people were out in the streets, taking Polaroids. They said the only real evidence in confronting police was to have photographic evidence of police brutality. They were accused of interfering with the law and being anti-police. They were demonized in the press. HAVE ANY CURRENT ATHLETES REACHED OUT TO YOU? “No one has contacted me. I’m not offended. They have my full support. They’re dealing within the context of the modern culture. Many of them don’t even know the history. “They don’t know that Muhammad Ali – the most recognized man on the planet – that he never would have been recognized and embraced around the world if he had not taken a stand. Ali made it possible for people to go to the polls and vote for a man with a funny-sounding name and put him in the White House, twice. The fact that he was the greatest boxer of his era will eventually be recognized as a mere footnote to his life.